Book a lakeside break for your New Year’s Eve celebrations and enjoy the most spectacular views and in-cabin luxuries as you count down to midnight. Our secluded log cabins with hot tubs underneath the stars are perfect if you want something different as you see in the new year. Whether you toast with champagne in your steaming hot tub or enjoy the lake views from your outdoor fire pit, New Year’s Eve on our reserve is an utterly unique experience. The log cabin by the lake was such a picturesque place to spend a few days away to celebrate – perhaps the first New Year’s Eve we felt really refreshed after! Whether you’re seeing in the new year with a group of close friends, the whole family or it’s just the two of you on a couples short break, we have the perfect cabin for your break. 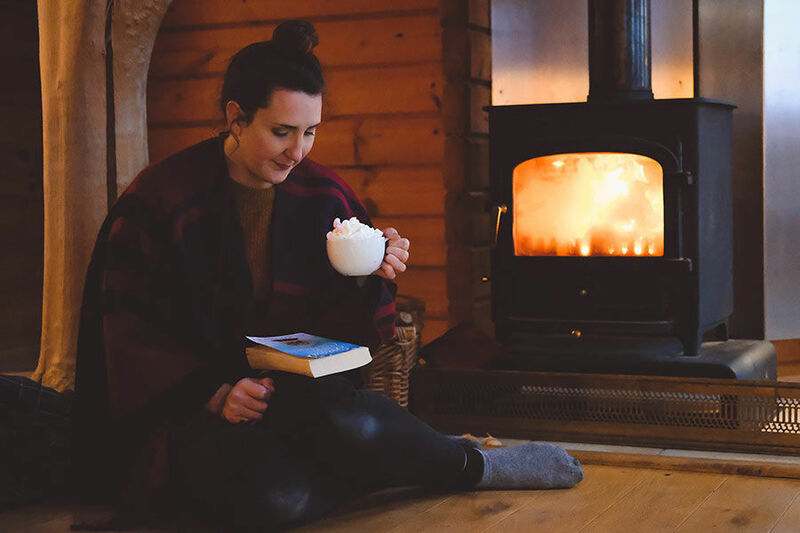 Our smallest log houses are ideal for a romantic New Year’s Eve or intimate gatherings whilst larger groups are suited to our biggest cabin, Mayo Landing (sleeps 11) which comes with a heated pool and wood fired sauna for all year round use. With lots of luxurious touches like big comfy beds, fluffy towels, an outdoor fire pit and traditional hot tub, all our cabins will provide you with a New Year’s Eve to remember. Where better to start the new year than at our relaxing and beautiful lake? If you’re trying to make a fresh start to the year with exercise and detox, being at the lake is a great place to kick it off with a short break fitness holiday. Take a run around our private 2.5 mile lakeside footpath, breathing in the fresh air and knowing the hot tub is waiting for you as a welcome treat. There are also lots of other ways to enjoy an active day outside such as exploring the lake by kayak or paddleboard or discovering the local Cotswold villages by bike.